Take a break from Livingstone with a short trip to Batoka Gorge in Kazungula, about 1h 15 min away. On the 4th (Tue), spend a relaxing day on the river with a rafting and tubing tour. There's much more to do: take in the dramatic scenery at Victoria Falls, see the world from above with a helicopter tour, view the masterpieces at Wayiwayi Art Studio and Gallery, and stroll through Livingstone Reptile Park. 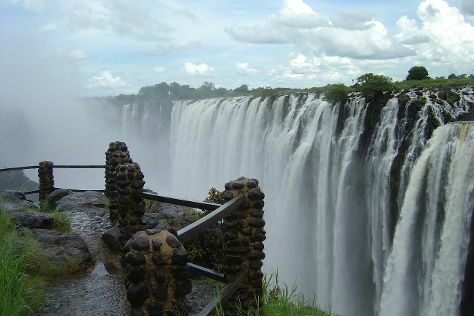 To see photos, more things to do, reviews, and other tourist information, read our Livingstone trip itinerary builder site . Christchurch, New Zealand to Livingstone is an approximately 29-hour flight. The time zone difference moving from New Zealand Standard Time (NZST) to Central African Time (CAT) is minus 10 hours. In June, Livingstone is a bit warmer than Christchurch - with highs of 24°C and lows of 14°C. On the 10th (Mon), you'll travel to Windhoek. Spend the 11th (Tue) spotting exotic species with a safari tour. Next up on the itinerary: admire the striking features of Christuskirche, stroll through Daan Viljoen Nature Reserve, browse the eclectic array of goods at Namibia Craft Centre, and play a few rounds at Omeya Golf and Residential Oasis. To find where to stay, photos, reviews, and more tourist information, read our Windhoek holiday builder app . You can do a combination of car and flight from Livingstone to Windhoek in 3 hours. Alternatively, you can drive; or take a bus. Plan for slightly colder nights when traveling from Livingstone in June since evenings lows in Windhoek dip to 9°C. Cap off your sightseeing on the 20th (Thu) early enough to travel back home.